Have skills from the old days been lost to technology? With the weight of a dense blanket of fog hanging over us, I silently poled my clients down a grass-lined bank while scanning the water. I was looking for the slightest evidence that might reveal the location of a redfish or trout. From just offshore of our position, the mechanized drone and chug of diesel engines could be heard through the thick haze as the oyster boats worked the bay reefs. The steady reverberations were interrupted by the sound of metal gears clanking as the oystermen hoisted their dredges, spilling the contents across the deck for sorting. Hearing the juxtaposition of these modern sounds with the timeless zip of a fly line whistling by my head made me reflect on changes in the life of a waterman. The simple definition of a waterman is a boatman or one who operates a boat. To me, this definition is lacking — a true waterman is one who makes his living on the water. Waterman is a title of pride that represents a way of life. It is a title that can only be earned, never given. The term waterman was originally used as far back as the 11th century to describe smugglers who used small boats for transportation on waterways in England. These smugglers were recognized for their exceptional seamanship skills. 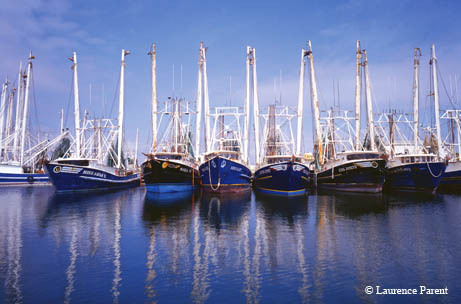 When the Chesapeake Bay of Virginia was settled by the English, the word took on a new meaning. During the warmer months, the watermen of the Chesapeake harvested crabs and finfish; during colder months, they would harvest oysters and shoot ducks for market. Many of them, to supplement their livelihood, guided wealthy individuals to sport and adventure. The term waterman is still widely used in the Chesapeake Bay region, but it’s seldom heard in Texas. 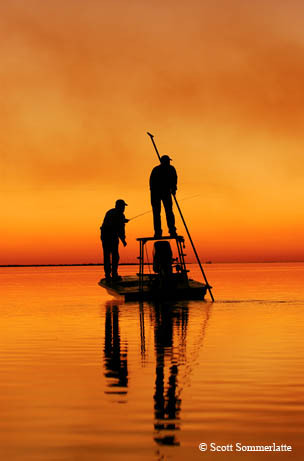 Regardless, there have been watermen working the waterways, bays and estuaries of the Lone Star State since this land was first inhabited. The first watermen in Texas, by all accounts, were the Karankawa, who were skilled at harvesting the bounty of the bays and estuaries. Settlers arrived by way of the Gulf of Mexico and made their home near the coast. Before long, the new Texans had taken to the water and developed the skills to feed their families and to earn a living. Some, like their Chesapeake Bay contemporaries, became guides. Numerous accounts in old journals and collections of letters from sportsmen regale us with the tales of the Texas watermen who would depart Corpus Christi by sail and navigate through the bays and estuaries to reach Matagorda. Once there, they would guide clients on the grandest of outdoor experiences, hunting the bountiful waterfowl of the time as well as quail and deer. At night, the clients would sit down to the finest of meals prepared by their guides, with not only game from their hunts, but also fresh fish, shrimp and oysters harvested along the way. To read these stories, you could imagine that these individuals were sitting down at the finest of modern sporting lodges, not on an old wooden boat that pitched frantically about in a gale and leaked mightily in a driving rain. Not every person who makes a living on the water can be considered a waterman. When you see a commercial shrimp or oyster boat out working a reef or hauling nets, some men on deck are nothing more than hired hands and strong backs. Someone on that boat, usually the captain, has learned the skills to get the job done and to get the ship and crew back to port in any conditions. That captain is the true waterman. What set the true waterman apart from others are skills. In the old days, these skills included being able to safely operate a boat or skiff in the harshest of conditions, having an intimate knowledge of the waters and having the ability to care for the harvest. In addition, many watermen built their own boats and mended their sails and nets; some were even masters at carving waterfowl decoys. Many learned how to make effective repairs while still on the water, allowing them to make it back no matter what the circumstance. In today’s world, there are still a few who hold on to the days of old. If you launch at Goose Island State Park to access areas on the far southern end of Matagorda Island and then make the turn out of St. Charles Bay, it is not uncommon to see several older fishermen in old ragged aluminum or wooden skiffs working over the oyster reefs with tongs. This method was replaced years ago by dredges that are dragged along the bottom by a vessel and then hoisted aboard by a mechanical winch. Here, though, these old fishermen are still holding on to the old-school ways. Perhaps they choose to continue to do it that way to preserve the traditions of their ancestors. Of the people who make their living on the water in the 21st century, there are some, like me, who are trying to hold on to some of the older traditions but find it difficult as technology pervades our lives. In days past, most watermen worked to harvest and sell their catch. Today’s professional fishing and hunting guides don’t have the same obligation, and their skills are not the same as those of the watermen of the past. 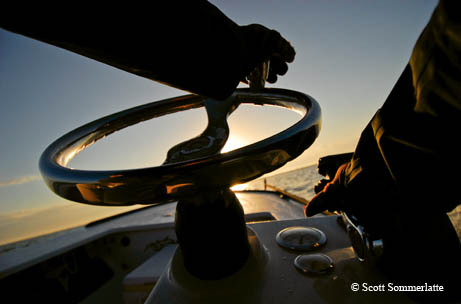 For modern watermen, old skills and knowledge are now supplemented by improved technology. The ability to read the water and navigate safely has been replaced by GPS and sonar — even computer maps and satellite imagery that can be pulled up on a cellphone. Sails, oars and push poles have been replaced by powerful, efficient outboard motors and electric trolling motors. We now order all the equipment we need from mail-order catalogs or the Internet, so we no longer need to know how to make those tools. Unlike the days of old, there is little fear of being stranded by weather or mechanical failure, of being alone on the water for days before another boat comes along to provide assistance. These days, there are boats everywhere — if one does not happen by, just pick up the cellphone. In comparison, we who make our living out on the water today have it pretty easy. Like those who came before us, we love the water and choose to make our lives there. It is our obligation to recognize the need to preserve the traditions of old. In turn, practicing these traditional skills will make us better watermen.